I wanted to revisit an earlier post comparing LEDs, CFLs and traditional incandescent bulbs. I found two different values for the power and light output of the Lemnis Lighting Parox II bulbs, and same folks at work were wondering the same thing. I decided to bust out my trusty Kill-A-Watt and see how much power the bulb was really drawing. I watched the meter for a bit and it never went above 4 Watts. So that’s a bit of a bonus. Out of curiosity I decided to plug my CFLs in and see how much power they actually drew. The 15W CFL spiked to 18W for a second but then settled in at 12W. After a while it climbed up to 13W and would have presumably stayed there. 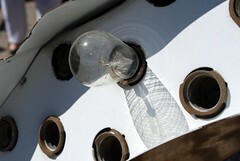 The 7W CFL globe settled at 5W. The incandescent was the odd one of the bunch, measuring 63 W instead of 60W. So when you replace those old lightbulbs, you may be saving a little more than you think. Again, the total lumen output might not be directly comparable because the LED bulbs really only emit light from a half globe, while the other bulbs cast light in almost all directions. Depending on the fixture this might make the LED seem brighter in comparison. One of the great things about working at Google is the company’s commitment to the environment. This week for Earth Day the company gave each employee two LED light bulbs – much more efficient than regular old incandescent bulbs and better in some ways than the twisty compact fluorescent (CFL) bulbs I already have around the house. Energy efficiency is one thing, but how do all these different lights compare visually? Three important measures to look at are the color temperature, the color rendering index (CRI), and the light output in lumens. I’ll talk a bit about both and explain a simple science demonstration you can do in your own home.